The other day, I was thinking about iced gems - those tiny little biscuits with hard pointy swirls of icing on top in candy colours that you got given at parties as a child. I never really liked them that much - the biscuit tasted dusty and the icing was hard enough to make indents in the roof of your mouth. Their only saving grace was their good looks. 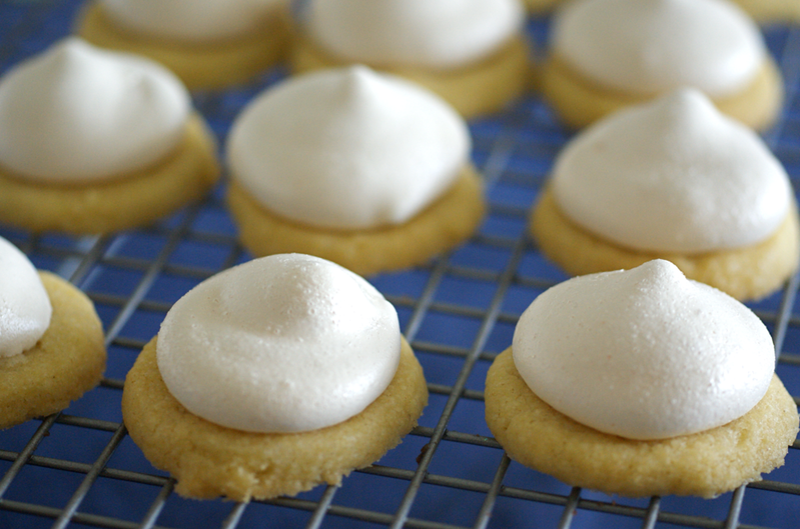 I decided that what would actually be really nice would be little biscuits with a pointy swirl of meringue on top. Why not? I've never seen these before, but they may well exist elsewhere. 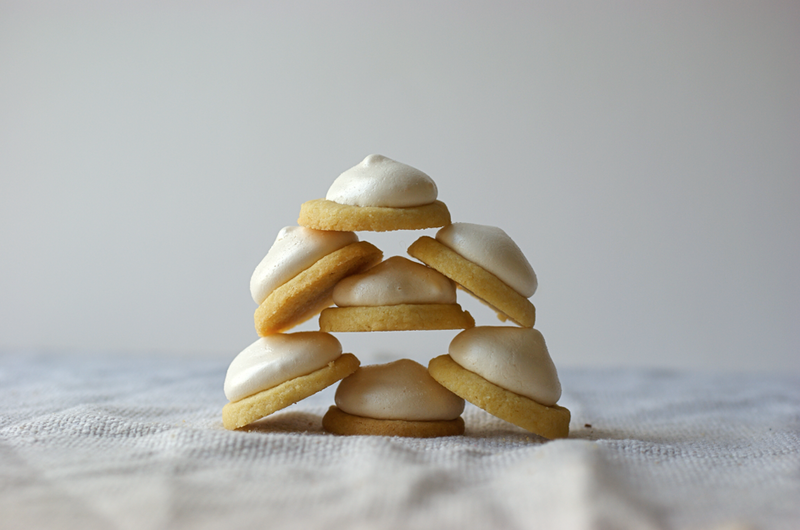 For my first test run I decided to keep it simple - plain little biscuits with vanilla meringue. 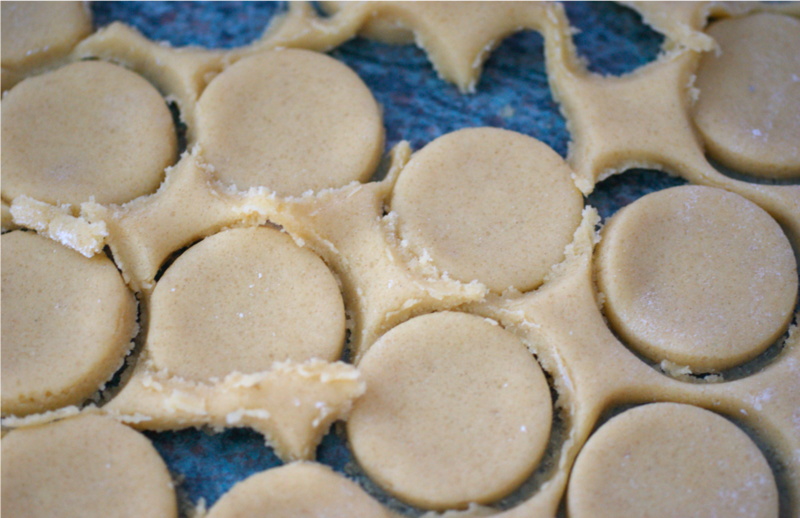 I made up a batch of Good Food's basic biscuit dough with some almond flour added, and then used about half of it to make little circles, as above. Instead of potentially wasting it all on one batch, I stirred a load of chocolate chunks into the rest and made slice and bake cookies. I also only used half the meringue this time, but another time I'll make a full batch of the recipe below. 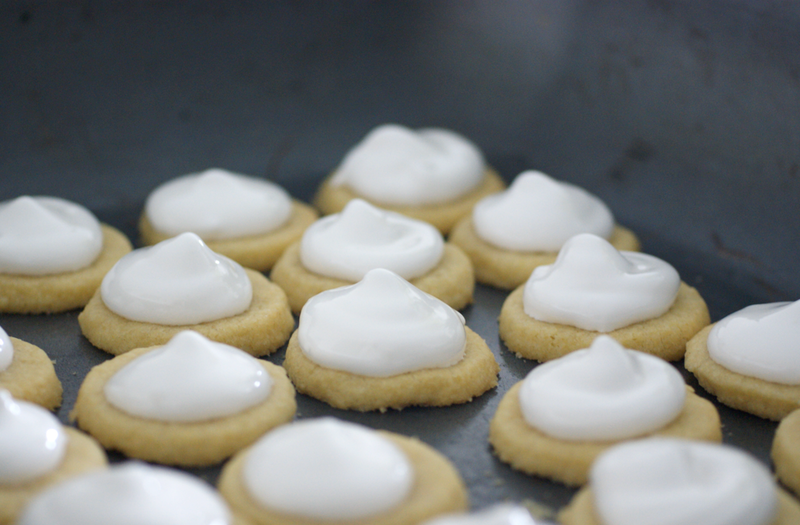 I baked them for a shorter time than normal and then set about piping meringue on top. 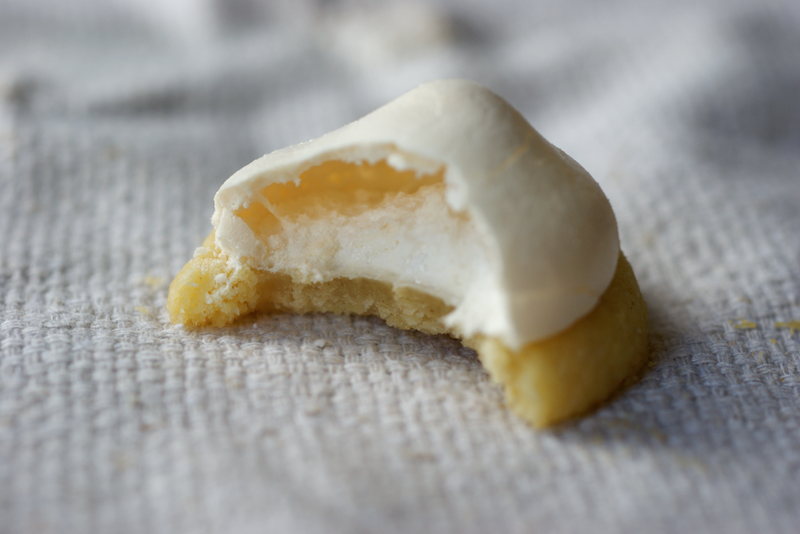 I used a very basic meringue recipe and just added some vanilla extract for flavour. I did a bit of an experiment and left half of the biscuits in the oven when I turned the oven off to see if they worked best crisp or marshmallowy. The unanimous decision was for marshmallowy, though the crisp ones were still really good. This idea came out really well - I was so pleased. 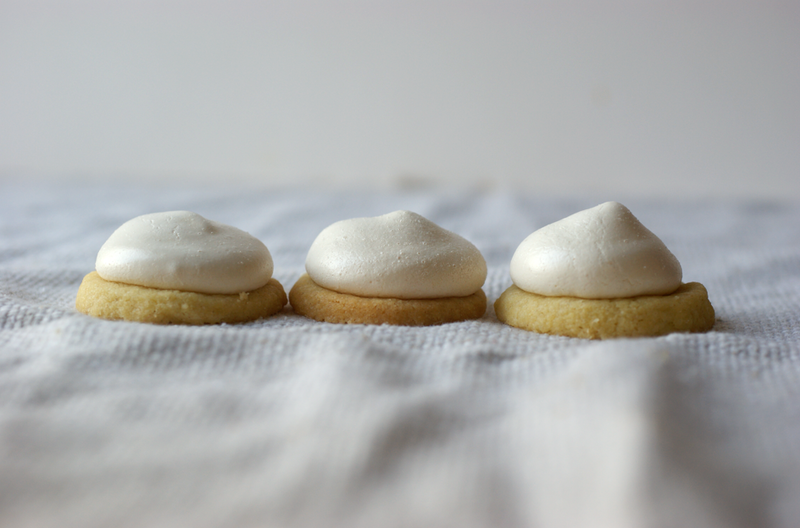 They're little buttery discs with a cloud of meringue on top, slightly crisp and squidgy in the middle with a little bit of chew. They disappeared very quickly - I definitely could have got away with a whole batch! I think the most exciting thing about these is the millions of variations that you could make - think about all the things you could change in the biscuit base, in the meringue - even put a tiny bit of jam or curd in between the two. I can't wait to start testing new ideas! Preheat the oven 180C. Beat the butter and sugar together then add the egg yolk and vanilla. Sift the flour over the bowl and add the almonds. Beat together into a dough. Roll out to about half an inch thick. Cut out with a small circle cutter (mine was a little bit bigger than a 2p coin) and place on a baking sheet with a little space between each. Bake for 8 minutes or so until pale gold but not fully done. Leave on the baking sheet to cool while you make the meringue. Turn the oven down to 140C. Put the egg whites into a mixer and beat until you have stiff peaks. Slowly add the caster sugar until thick and glossy. Fold in the vanilla then transfer to a piping bag with a medium tip. Pipe small swirls of meringue onto each biscuit. Put in the oven for about 15-20 minutes or until golden brown and stiff. Remove from the oven to a cooling rack. delightful! we have a ton of egg whites in the fridge to use -- now i've found a recipe! perfect task for me while the fiancee is on a cross-country flight this weekend. p.s. is that cake on the side a wedding cake? You are so talented to spend your time working this recipe out. I love little gems! You could add food colouring to the meringue to get all the colours the little gems have. But these white ones look so cute! Kate: Thank you! I enjoy working out ideas so much. Heather: I hope they go well! Neither are wedding cakes - I've never made one! Would love to at some point though. Helen: I very nearly added food colouring to some of these - next time! These look tasty. An excellent dessert. They were absolutely delicious- I ate far more that I would normally eat- they were so "just one more" and another "just one more"! They melted in your mouth and left a lovely aftertaste. These look delicious! Just lovely! They look fab. Well done you. On the weekend I wanted to make a biscuit from the cookbook "The Turkish Bakery", which is a biscuit mix with a meringue mixture spread over the rolled out dough and rolled up like a swiss roll, then cut into little biscuits. Now everything was going fine until the biscuit dough was not rolling out too well - it was too soft and on reflection I should have just put it back in the fridge, but you know how these things go - overcome with anticipation! So I was in the this situation where the meringue was lovely and the biscuit dough was still great, so I just thought "stuff this - all this hard work and waiting" - I mixed the two together (not to mix into each other, just combine), baked them as normal and they were a treat. I actually think they will also be great added to chocolate ice cream - imagine the biscuit parts soften by the ice cream and the crunch of the meringue? I think that's a winner!